This year marks the 20th anniversary of Beijing United Family Hospital, the first western-standard joint-venture hospital to open its doors in China. Started as a women’s and children’s hospital, Beijing United has evolved into United Family Healthcare (UFH), the premium, private healthcare network across in China, offering a full range of healthcare services through its hospitals, clinics, and centers of excellence. Michael C. Wenderoth, who served from 1994 to 1997 as the hospital’s project manager, spoke to Roberta Lipson, CEO and Chairman of the Board of UFH, about the hospital’s challenges and successes, and how those reflect on a changing China. When we started the journey to establish Beijing United Family Hospital in 1994 (I worked for Chindex International, Beijing United’s parent company, in the 1990s), Lipson already had more than a decade of business experience in China. Arriving in Beijing in 1979, she established Chindex in 1981 and took it public on NASDAQ in 1992 as the largest independent American distributor of high-end western medical equipment in China. The interview below has been edited for brevity. WENDEROTH: Roberta, first I want to take this opportunity to publicly thank you. In 1994, you hired a 22-year-old American history graduate to help you establish Beijing United Family Hospital (hereafter referred to as “Beijing United”). You gave me a chance, more responsibility than I was due, and put me through the school of hard knocks. Margaret Mead was right: “Never doubt that a small group of dedicated people can change the world, indeed it is the only thing that ever has.” Thank you. Establishing and successfully running any business in China is hard, yet you consistently have done this over almost four decades since you founded Chindex, the parent company of Beijing United, in 1981. When we opened Beijing United in 1997, you shifted Chindex’s business from medical equipment into healthcare provision. 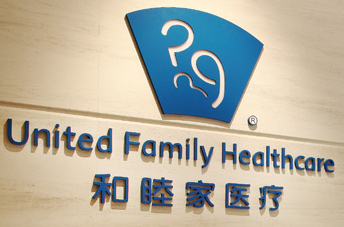 Beijing United has now become United Family Healthcare Network (hereafter referred to as “UFH”), blazing many firsts, including becoming the first non-U.S. hospital to receive the prestigious Joint Commission International’s accreditation, as well as numerous accolades and attention from international media. Your vision in 1993 was to provide women and children – primarily expatriates – better patient-centered healthcare options in China. Most people said you were crazy and laughed at you. Did you really envision then that United Hospital would become what it is today, in 2017? What, if anything, differs in how United Hospital looks today versus the vision you had for it in 1993? LIPSON: To be honest, I can’t say I foresaw the true potential of UFH when we decided to build our first little hospital. I knew at the time there was a very meaningful opportunity to model a new approach to healthcare for China. I thought that if we could show that a different approach to healthcare was possible on the ground in China, there were 10,000 or 20,000 expats in Beijing who had a great need for an upgrade in the services that were then available. I knew that this limited expat market could sustain our small 50-bed hospital. I thought that perhaps one day the economy of China would evolve and there would be some demand among the local population. But I, like most others, had no full sense of the great pace of growth of the Chinese economy, the great pace of change in the preferences of the Chinese consumer, or the impact in the changing supporting policies from the Chinese government that would allow us to grow into the multicity healthcare system we are today. WENDEROTH: So it was a little bit of a leap of faith? LIPSON: Through the 1980s we had been leading delegations of Chinese officials to the U.S. They appreciated much of what they saw at some of America’s best hospitals, but they were uniformly sure that little of the best practices they saw could be implemented in China. Part of me wanted to just prove them wrong and set up a pilot model closer to home. On the other hand, we did build a model we believed could be sustainable and reproducible in China’s major cities. WENDEROTH: Can you give an example of the “best practices” the Chinese saw in the U.S. that they felt could not be implemented in China? LIPSON: They failed to see how the American patient-centric approach, or one might say a viable market-based model, could work in China’s State-run healthcare system. But even simple things, like how to make a hospital not smell like a hospital. How to have patients not line up for hours at the best hospitals [as was common in China… when there were] neighborhood clinics available they could go to. How to reduce the inappropriate overuse of antibiotics. WENDEROTH: Setting up that pilot model proved challenging. Healthcare is highly regulated, and so-called “nonmarket” forces (dealing with government policy) are key. Managing government policy consistently ranks as one of the most difficult areas for western executives to get their arms around in China. Again, you have been a pioneer in this front (not only setting up Beijing United, but being the first to set up bonded warehouses, creatively using export-import loans, to name a few). You also continue your active involvement in the American Chamber of Commerce, policy groups, and are sought after by policy makers from many countries. Can you share a few strategies that are critical to making things work from a nonmarket perspective in China? LIPSON: China’s economy for the past 40 yeas has been consistently growing at an unprecedented pace, and the society’s needs are evolving as quickly. It has been impossible for policy to keep up with these changes. Policymakers are further hampered by a multitude of interest groups that can be resistant to changes, even if those changes might be better for society as a whole. Furthermore, central government policy reforms are implemented at a varying pace and in varying ways in different local geographies. Sometimes the clear policy declarations of one government organ will be contradicted by another government department of equal impact. All of this can make for a very challenging policy environment. My cardinal rule in overcoming this potentially confusing environment is to keep in close communication with all stakeholders and policymakers in the government. This is challenging, but we have found that the feedback we can offer to policymakers truly has been appreciated and often reflected in subsequent policy reforms. I firmly believe that ultimately the government is working to improve the policy environment and make China a healthier country. Actually the big plan is always outlined in each five-year plan, and most recently by the State Councils Healthy China 2030. I have always felt that if United Family’s strategies fit within this framework, the attendant policy specifics will eventually be in place to support our direction. WENDEROTH: Talk about dealing with shifts. The concept of growing a business and “pivoting” (shifting one’s business focus or model in reaction to the market) is a popular buzzword and is viewed as a critical skill to managing in complex, rapidly changing environments such as Silicon Valley or China. As you established and ran the hospitals over the past 25 years, do you even think in terms of “pivoting,” and is that an important skill to working in China? If you do, was there any particularly important “pivot” that Beijing United or UFH made that you can share? A key lesson learned? LIPSON: When we first opened, we relied on the business of the international community. As the Chinese economy developed and the local market became the largest growth opportunity for us, we had to figure out how to design our systems to deliver the best experience for our local patient base while not losing the international aspects of our offering that set us apart, never losing our core value of evidence-based practice. We continue to adapt as the mix and knowledge evolve. The other important pivot developed as we grew from a single hospital to a hospital-plus-community clinic model, and then to a multicity system with the full continuum of care from clinic to acute-care hospital, to rehab, to home health, providing care along the full life cycle, from before birth to hospice care. We upgraded our management model while deploying technology to help us deliver the same standard of quality offerings over both geographic and temporal continuums. WENDEROTH: On your “management model,” UFH is unique in that it employs about every culture imaginable (China and foreign), and serves patients of many cultures in a very high-service environment (having your child is a more important event than say a wedding or five-star hotel experience). Getting it “right” on the people side and intercultural side is critical. Can you share what is key to getting the intercultural part right? For a foreigner coming to China, how would you recommend them to best prepare themselves for working/leading effectively in China? For that matter, for your Chinese employees, what is most important in working with westerners? LIPSON: Actually, this is one of the ingredients at the core of our “secret sauce.” Our teams are not only multicultural in the Chinese plus foreigner sense, but also gender-balanced and balanced among educational backgrounds (medicine, nursing, management, etc.). Having a management team fostering an environment of mutual respect and appreciation has allowed us to glean learnings from multiple perspectives. Open dialogue among often varying viewpoints allows us to examine issues a multidimensional way, often coming up with innovative solutions. We celebrate this diversity and it is explicitly reflected in an element of our core values of ICARE (Innovation, Caring, Accountability, RESPECT and Excellence). Being a multilingual institution, almost all of our 2,000 plus employees can communicate with each other in either English or Chinese. We encourage language and culture study and make opportunities for further development available to all our team members. WENDEROTH: Are there any big myths that foreigners (and especially the West) have about China? LIPSON: That it is Communist? Actually, China is one of the liveliest market economies going that operates alongside an influential state-owned sector. That it is monolithic? Actually, China is a country full of diversity: linguistic, ethnic, cultural, culinary, even policy environment. But it is also tied together by a strong national identity. WENDEROTH: In 20 years, there must have been many crucial moments for you and the hospital – something insightful, a failure, or a moment that tested your resolve as a leader. Surely the SARS crisis, weathering economic downturns or changes in management would be obvious issues I could ask about. But they may not have been what tested you the most. Can you share one of those key moments for you and the organization, and specifically how you overcame it, what you learned from it? LIPSON: I would say your first guess was the most clear. The SARS crisis was a real test for us, for all of China, and for that matter for the whole world’s healthcare community. We realized that no matter how close we were as an organization to getting our own systems as close to perfect as possible, we were still reliant for so much on information from the government, and support from the wider healthcare community. We realized that we could only do our best for our patients if not only our systems were working but also if the information coming from the wider system was reliable. During SARS both we and the government realized that improvement was needed in these areas in order to prevent another crisis. The period of SARS was frightening in revealing stages. In the beginning, although we had already diagnosed a high-profile case of SARS at our hospital outpatient department, there was no official recognition yet of the problem in China. By the time an official recognition of the problem happened and a referral system was set up for confirmed cases, all referral center hospitals were quickly overwhelmed. Many of us worked around the clock to upgrade systems to keep up with the evolving situation and find ways to keep our patients safe. Luckily by the time the epidemic passed, all parties – including the government, our hospital, and the wider healthcare community – realized a lot of [lessons] could be gleaned from the disaster and quickly took those [lessons] on board. As a result there is a lot more transparency and timeliness around public health data, hospitals are better designed for infection control, and we feel that the whole system can work in a more reliable way. WENDEROTH: Tell us more about operating in China. Chinese firms move fast, operate lean, or benefit from understanding their native environment well. Some copy quickly, many innovate in their own right, and others benefit from quasi-government support. Even now Chinese are rapidly moving into upscale healthcare provision. Outside of China, management thinkers have gone so far to say that we are seeing the “end of (traditional notions of) competitive advantage,” and that the only competitive advantage today is being adaptable and moving fast. Can you share how you think, or UFH thinks, about dealing with Chinese competitors? Do Chinese firms think, act, or manage differently from the conventional “western” view? If so, what can western business learn from the Chinese? What is the competitive advantage western firms need these days? LIPSON: UFH has been innovating, adapting, integrating, and growing for 20 years. Our success has been rewarded with many admirers and imitators. We consider this confirmation of our success and celebrate our models of care that have found currency in both the public system as well as other private startups. WENDEROTH: What do you do when you are blatantly copied? LISPON: We do not appreciate when imitators also pretend to “be us,” by copying our logo, brand name, as well as surface design elements of our facilities. We have successfully sued many of these imitators. Healthcare, however, is extremely complex (as Donald Trump recently discovered), and so new startups tend to start with the simplest, most lucrative segments. It is relatively simpler to start an obstetrics hospital than a full-blown general model of care. UFH’s system of Continuity of Care for our patients has evolved over time. Having the complete integrated continuum of care – including community clinics, acute care general hospitals, home health, rehab and hospice – will take newcomers years to develop. WENDEROTH: So, in the end, the key is building a long-term business that serves your customers’ needs and fits the changing environment, period? LIPSON: The UFH’s full-service offerings allow us to become the lifelong healthcare partner for our customers. In response to the growing acceptance of commercial health insurance we are able, together with our insurance partners, to take on the risk of the health of whole population groups. This can only be done in a system with the full spectrum of offerings from primary care and prevention to acute care intervention capabilities. No matter whether Chinese or foreign, the keys to a company’s long-term success in my mind are not only nimble adaptability but persistence of principal in moving toward a goal, a strategy that is consistent with the betterment of society, and the ability to inspire passion in the whole workforce about achieving this goal. I believe that the promise of only financial rewards, no matter how rich, will always be trumped by sound financial rewards plus the satisfaction of producing a good or service that benefits society. WENDEROTH: If you had a “do-over” what would it be? Any regrets? Hindsight is 20-20, of course! LIPSON: It’s hard for me to say that I have any regrets. Every misstep has been a learning experience. WENDEROTH: You’ve interacted with policymakers, industry titans, company alumni, the new generation of millennial Chinese who were born after the 1980s, and a whole community outside the business world, and have for more than 40 years. What has most surprised you about China’s transformation? What should we be watching most closely? LIPSON: The huge personal wealth that has accumulated, and the entrepreneurial spirit that is everywhere. Perhaps we should have predicted this. Specifically, as it applies to our business, the increasing acceptance that – in addition to basic healthcare, which the government should provide – an increasing number of consumers are willing to see choice in healthcare as a private good. WENDEROTH: Over the past 40 years you’ve been at the center of what many would argue has been the greatest transformation of a country in world history. If you had young kids (I know yours are older now), what do you feel they should be studying or learning to be best prepared for the future? LIPSON: I feel like my kids have had a great education in China in the international school which really did prepare them well for today’s world. I am a strong believer in the global community. Being able to communicate in several languages, including a deep understanding of the language of data will continue to be important. At the end of the day the world is made of people, and having the ability to understand and relate to people will remain the essential element for success no matter how the world changes. LIPSON: That’s a very personal question. I have always lived by the belief that striving to “have it all” means that I will get to have “most” of what life has to offer. Some elements may be more or less successful. However, no one can have it all solely relying on themselves. I have been blessed to have a husband, children, partners, colleagues, neighbors, and friends who have contributed to my success and allowed me to contribute to theirs. WENDEROTH: Thank you for your time, Roberta. Photo was provided by United Family Hospital.